Eric and I buy a lot of essentials in bulk. As long as you are using/eating the item without waste, it’s a great economic option. During our last visit to Sams Club, we saw a special on Eggos, $5.00 for 60 waffles. Though it was not on our list, we decided to splurge and buy the box. It was not until I got home and started filling the freezer that I realized we had A LOT of waffles. I started searching the internet for different ways to eat the Eggos and found there are several recipes and meals that could incorporate the waffles, one recipe even done on the ‘Top Chef’ show. I was especially drawn to the hand held quiche. 1. Place heated KELLOGG’S EGGO Homestyle Waffles on foil lined tray coated with cooking spray. Sprinkle each waffle with cheese and bacon. Combine remaining ingredients and spread evenly over each waffle. 2. Bake at 350° F for 25 minutes or until set and lightly browned. Serve hot. 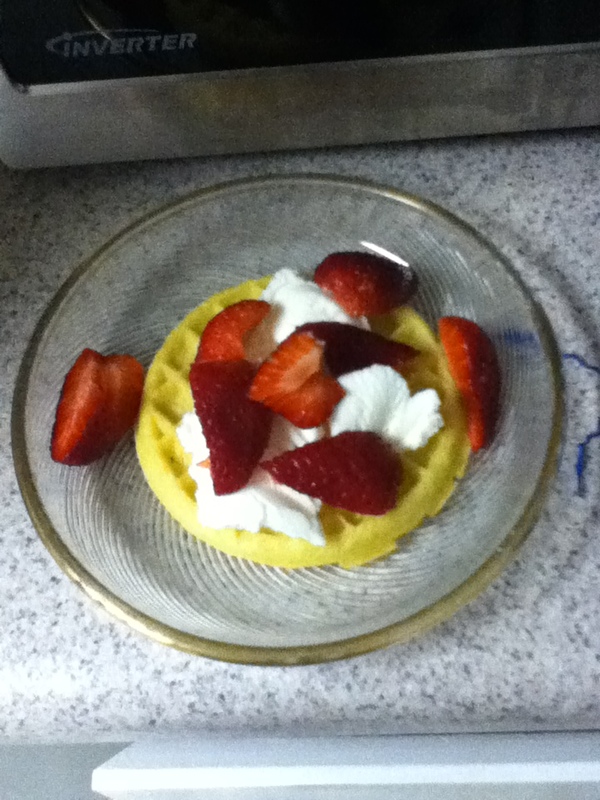 I have also been making mini dessert sundaes with low fat vanilla ice cream and fresh strawberries. Yum!